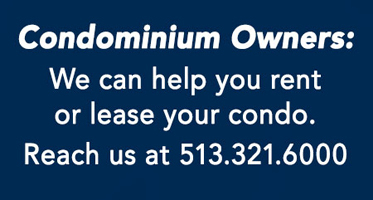 Information on Riverside Terrace Condominiums. These are River View Condos located at 2401 Ingleside Avenue, East Walnut Hills Cincinnati. Click Here to view any condominium currently available for purchase. 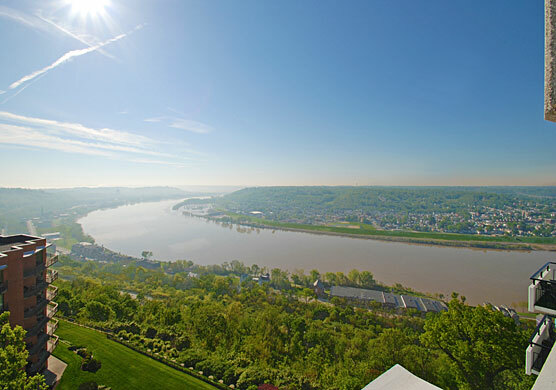 General Information: River Terrace is precisely situated in East Walnut Hills on one of the highest points in Cincinnati. The building itself adds 12 stories. Residents report unprecedented views. It's located on a quiet cul-de-sac in an area of historic, interesting homes. The building itself is like a beacon, given that it can be seen from many miles. If convenience is important, you should note that it takes less than 10 minutes to reach Downtown, The University of Cincinnati or Xavier University. Fine dining is readily available from a wide selection of restaurants. However, many residents enjoy making meals in their gourmet kitchens and dining al fresco on their spacious balconies. If you'd like to be notified when a residence becomes available for purchase, Lee or Sarah can arrange it. If you are considering selling your residence, please reach us. We provide extraordinary marketing reach - locally and around the world. We are part of a network of more than 22,500 real estate agents in over 950 offices in 70 countries and territories. We share referrals on a continuing basis. If you're interested in leasing your home, our sister company, CincyRents can manage that task for you! Lee and Sarah provide truly gracious professionalism and will happily show you any available residence. Take your place on top of the world!